Austrian mathematician and political economist; born at Leitomischl, Bohemia, March 14, 1854. As a boy he showed unusual aptitude for physics and mathematics; and he continued his studies in these branches at the University of Vienna, graduating as doctor of philosophy in: 1878. In the same year he founded and edited the "Mathematisch-Physikalische Zeitschrift" at Vienna. He is the discoverer of the mathematical analytical curve of the probable length of the age of man. 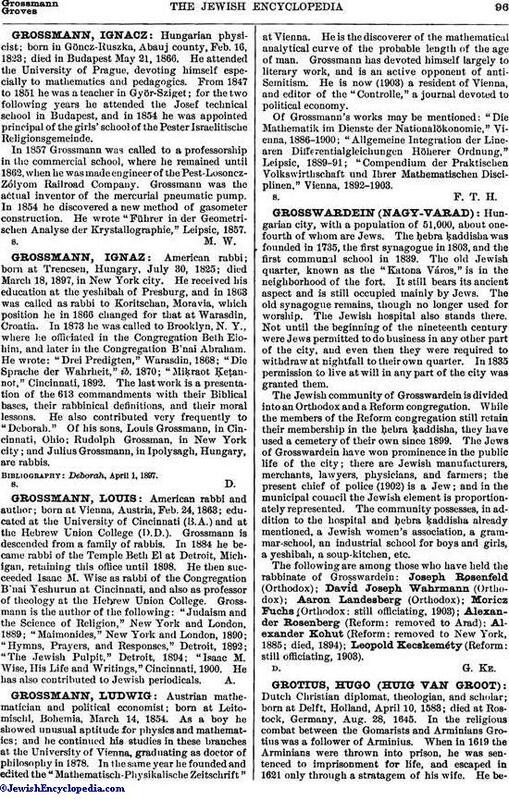 Grossmann has devoted himself largely to literary work, and is an active opponent of anti-Semitism. He is now (1903) a resident of Vienna, and editor of the "Controlle," a journal devoted to political economy. Of Grossmann's works may be mentioned: "Die Mathematik im Dienste der Nationalökonomie," Vienna, 1886-1900; "Allgemeine Integration der, Linearen Differentialgleichungen Höherer Ordnung," Leipsic, 1889-91; "Compendium der Praktischen Volkswirthschaft und Ihrer Mathematischen Disciplinen," Vienna, 1892-1903.